Awww. Isn’t this just adorable? And totally candid...not posed at all. This picture was captured live during the processional at a wedding ceremony. 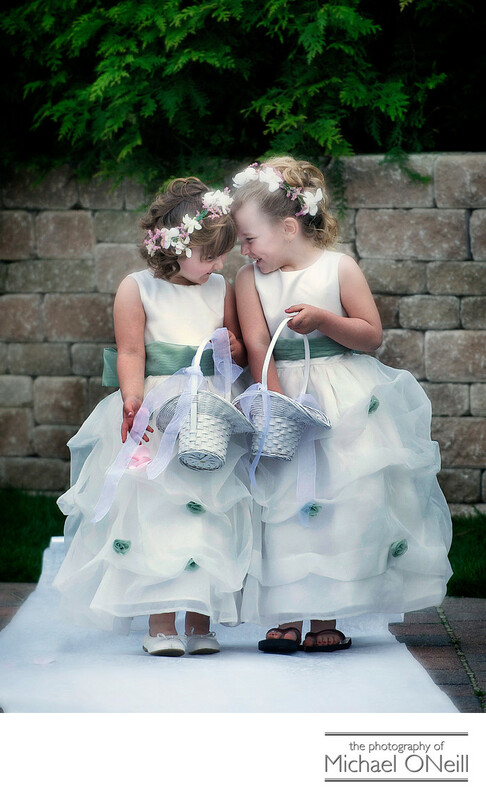 The two precious little flower girls were excited to be in the bridal party and had listened intently to what their duties were. As they started up the aisle they faced each other and shared this moment. I’d love to know what they were saying to each other but never will. What I do know was that I was ready for it. Great wedding photographers, especially those with extensive experience, instinctively anticipate moments like this and capture them perfectly. It is what we do. And it is what you love...to see and re-live those special little moments that happened on your wedding day. I see so many of today’s wedding photographers taking a picture and then staring at the back of their cameras to make sure they "got the shot". Most times the best shot is being missed as they stare at the back of their camera for reassurance and validation. I cut my teeth in this business shooting film when you had to KNOW you got the shot when you pushed the button. And we knew we got it because we understood, practiced and perfected the fundamentals of photography. If you would like a photographer who is always looking for the next great shot, not looking at the last one he took, give me a call. I guarantee I’ll capture all those precious, fleeting moments that most "photographers" miss.